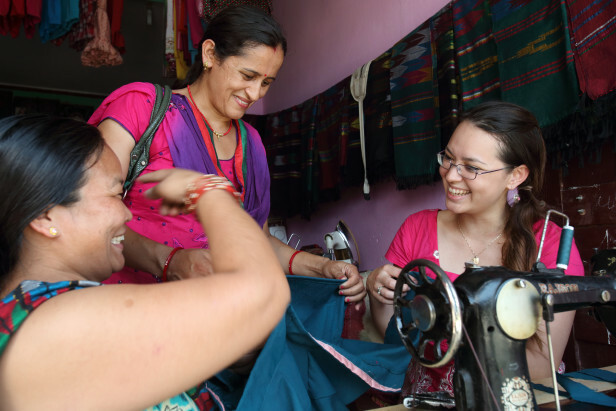 In this article -- originally featured as part of Devex's She Builds Innovations effort highlighting promising trends and innovative solutions at the intersection of women and development -- Leith Greenslade tells the stories of four amazing women-led social innovations that are driving positive development for women. We hear a lot about the relationship between women’s empowerment and development, but not as much about the women who are doing development and hardly anything at all about the very different models of development many of them are pursuing. There is a growing group of women — graduates of the traditional aid world and fresh recruits from business school — charting a new course by founding and leading their own social businesses. These social businesses are designed to turn a profit and to keep sustaining their own growth by selling products and services until a particular social problem is solved. Along the way, they are creating jobs, many among the same women they are serving, and attempting to build markets where no markets have existed. These women are disrupting the development landscape by challenging the dependence on donor dollars and the dominant view that you can’t make money and solve a social problem at the same time. Who are they? Meet Zubaida Bai, founder and CEO of AYZH, a social business that designs, makes and sells products to improve the lives of women in resource-poor settings. In 2010, Bai launched her first product, a birth kit called JANMA, which gives women all of the basic items they need to have a clean and hygienic birth — all in a $2 kit made from biodegradable jute. The kits are made in India, by women in the state of Tamil Nadu, and sold to for–profit maternity facilities and health clinics as well as to nonprofit organizations. Other products in development include post-partum hemorrhage kits and a new sanitation and hygiene solution for women. With fellowships from Ashoka, Echoing Green and TED India and a host of awards, Bai’s work has been recognized by the social entrepreneurship community. But she still struggles to get the attention of the mainstream development community and despite her focus on two of the Millennium Development Goals where we need progress most desperately — MDGs 4 and 5 — the public health community has not yet embraced her work. With her master’s in engineering (product development and design) and an M.B.A. (social and sustainable enterprises), Bai is tackling the global challenge of reducing deaths in childbirth in a very different way — by attempting to build a market for the products and practices that will reduce the risk of infection that too often accompanies childbirth in resource-poor communities. When Jane Chen and Rahul Panicker, founders EMBRACE Innovations, launched a new infant warmer into the Indian market in 2010, it was simple to operate, did not require a constant supply of electricity and most importantly, it was one hundredth the price of competitor products. Embrace Nest is now being purchased by medical facilities in 11 countries on three continents to reduce newborn deaths from hypothermia, a particular challenge for the 20 million babies born each year with low birth weight and at higher risk of hypothermia. A second warmer is also available — completely non-electric — and suitable for use at home. Not content to stop with infant warmers, Chen and her team are planning to extend their product line to other health technologies. Like Bai, Chen is a TED fellow and has received a raft of design and entrepreneurship awards for her work, but the public health community has not embraced her solution. In fact, there has been opposition to her infant warmer because it is different to the mode of infant warming recommended by public health authorities — skin to skin contact often known as “kangaroo mother care.” Chen and her team have responded that women who are working and/or caring for other children, women who are in transit, who are recovering from a traumatic birth, and those in disaster-relief and post-conflict settings need a quality, affordable infant warming option and their product is designed to meet their specific needs. The debate has revealed a major difference in the way social businesses view women – as customers with complex needs who should be able to make good choices according to what suits their particular situations. Open to partnering with the public health community, EMBRACE Innovations recently launched a not-for-profit arm, embraceglobal.org. When New York Times columnist Nicholas Kristof wrote about SHE Innovates in New York Times Magazine in 2010, founder Elizabeth Scharpf was inundated with queries about why and how it was transforming highly absorbent fiber from banana trees into low-cost sanitary napkins for women and girls in Rwanda. The “why” was easy to answer, as Elizabeth had been told in hush tones by many women and girls that their lack of access to sanitary napkins during menstruation was keeping girls out of school and women from work, simultaneously limiting educational performance and lowering incomes. The “how” was more difficult because Elizabeth didn’t want to import donated napkins and simply hand them out. She knew that when donor money ran out, so would the sanitary napkins. Instead, she wanted to build a business that would locally source and manufacture quality, low-cost pads and sell them, employing a lot of women in the process. And that is what she did. A SHE Innovates factory in Rwanda will be producing 1,200 napkins per hour and selling them directly to Rwanda’s schools and at other outlets. Elizabeth has big plans for the future. She wants to franchise the sanitary napkin business and see it move all around the world and then she wants to move into other “taboo” areas in health and solve those problems by building market solutions. One of the most disruptive initiatives to emerge in women’s health in recent years is Meg Wirth’s Maternova. Think amazon.com and imagine a website where anybody in the world can log on and search for essential maternal and child health products, assess their merits by reading expert independent reviews as well as user feedback, purchase and have them delivered directly to your door. As most of the products Wirth and her team assess and sell target the leading causes of maternal and newborn death, she is offering a level of access to lifesaving interventions that is unprecedented for the world’s most vulnerable communities. Wirth currently sells 40 products online, including an obstetric kit, offers access for a fee to a Maternal Innovation Index which tracks 250 maternal, newborn and child health innovations and like EMBRACE Innovations, has recently launched a nonprofit arm, Maternova Research. The entire Maternova offering is of huge potential value to the public health community as it struggles to find efficient ways to build demand for and supply life-saving products to the regions where maternal and child deaths are concentrated. These are just four examples of what is a growing movement of women-led social businesses with a very different take on how to solve some of our most critical global development challenges – in this case, women and children’s health. It is early days yet, but if these women have found a more efficient and effective path to achievement of development goals — one that delivers results faster, at lower cost and with considerable side-benefits (like more jobs for women) — then we need more of them, a lot more. And if this preference for social business models is directly related to the way women are approaching development — rejecting the bipolar division of for-profit and not-for-profit structures and striving to transform disempowered populations into empowered consumers rather than passive beneficiaries — then we need to encourage a lot more women into the social business space. One thing is certain, with the twilight of the Millennium Development Goals and the dawning of a new set of sustainable development goals, the time is ripe for models of development that pursue economic growth and social development in an integrated way, which is exactly what social businesses aim to do. The fact that it is women who are leading this charge may reflect a deep desire not to perpetuate the societal and particularly the gender inequalities that lie behind so many development challenges and which are too often reflected in the traditional redistributive aid models that fail to engage women as active and equal participants in their own advancement.